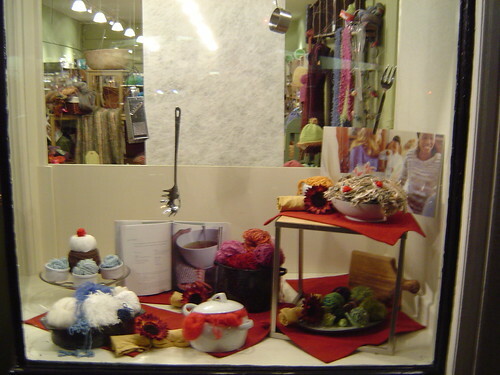 So I’m lucky enough to live around the corner from a great knitting store, Noe Knit. My friend Susi opened it this year & its been so much fun helping out in the store. She has even let me do her window displays from time to time which I love. I used to do record store windows & its wonderful to use those skills again. Here’s the window I did this month with a sort of Thanksgiving food theme. Of course while I’m there I have to pick up some yarn. 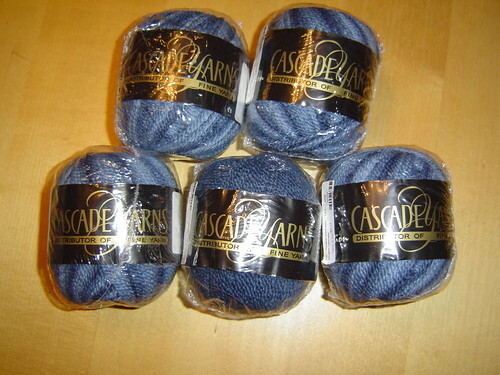 I picked up some Cascade Fixation for Peggy’s armwarmers. The spandex in it should be really good for these. I know the last thing I need is more yarn BUT Chicks with Sticks is having a yarn swap on Monday & I am determined to bring a bunch. Plus just two weeks ago I gave a bunch of partial balls to the local elementary school to use in their knitting class. So, really when you think about it I deserved more yarn. 13 years ago by Kat in Knitting , Needlecraft , Project Project Runway , Uncategorized | You can follow any responses to this entry through the RSS feed. You can leave a response, or trackback from your own site.